I have been treating acne for 20 years now. This is one of the best systems I have come across for treating acne. 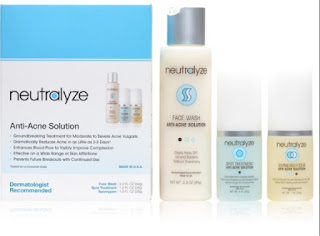 Neutralyze® is a system that was developed. By dermatologists, cosmetologist a and experts in the skincare field. What makes this system so different is that it is a prophylactic system rather than one that aborts acne. This means it prevents acne rather than treats it. That is the key to treating acne, prevention. Acne is caused by two main things: dead skin cells clogging up the hair follicle with sebum and the acne bacteria. This system helps to clear up those dead skin cells, get rid of the sebum and it gets rid of the acne bacteria. This way acne is not formed. Blackheads, whiteheads and pimples are not formed. This system's main goal is to help to increase blood flow to the skin, thus improving the complexion. This system is also good for dermatitis, rosacea, folliculitis, psoriasis and razor bumps. It helps to relieve inflammation and irritation. The system starts to work in as little as 2-3 days.